We repair and perform maintenance on all makes of garage doors & garage door openers. Lancaster Door Service, LLC provides Lancaster County, Pennsylvania with fast and reliable garage door repair and garage door opener repair services. We perform professional installation, maintenance, and repairs for Garage Doors, Garage Door Openers, Garage Door Track Assemblies, Extension Springs, Torsion Springs, Hardware, Garage Door Operator Parts, and other mechanical door parts. 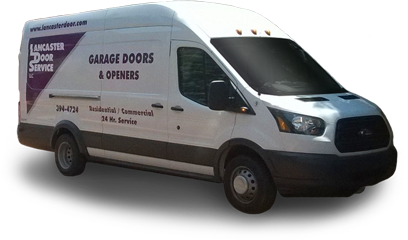 The Lancaster Door Service team of technicians are career professionals who take pride in every job that they do. We keep our service trucks well stocked with the best parts in order to fix almost any brand of door or opener during the initial visit. Let us give you the peace of mind in knowing that your door has been repaired efficiently and correctly. LDS maintains entire garage door operating systems. As certified Garaga® Experts, we proudly meet the highest standards of the professional garage door service industry. Regular complete inspections of your garage door and garage door opener system are very important. We perform thorough testing and verification procedures to ensure that all safety features are working properly. We stock most springs, hardware, and other parts for a wide variety of garage doors and openers. We also carry a large inventory of parts for the do-it-yourselfer! We professionally repair or replace garage doors, garage door hardware, garage door openers, and other parts.